I’ve been having a bad day with technological innovations today. It started with an announcement that Blogfrog was to close. OK, I’ve already had a rant about that over on my other blog so I won’t say any more about it here. Then I discovered that in a book review comparing two books on Good Reads, all the links were to the wrong books. Good Reads has a nice system in which you can type [book:Asta’s Book] or [author:Barbara Vine], and it will automatically link them to the page describing the book, with other reviews, or the page telling about the author and their other publications. Except in this case it didn’t work. Both book titles were linked to the wrong books. The book called The child’s child was linked to one called The snow child , by a different author. Fortunately, having discovered it, it was relatively easy to fix in the copy on my blog, but much more difficult in the original review on Good Reads. These clever programming tricks are nice when they work, but create even more work when they don’t. Then I went on to family history. I found that a second cousin of Val’s was apparently interested in family history, but was not even in touch with her own first cousins, and apparently didn’t even know who they were. We had been in touch with them some years ago, but weren’t sure if they were still at the same addresses. I found one of them apparently on Facebook, and wanted to send a message, to check if it was the same person, and if it was to connect them with other people. After all, that’s what Facebook is for, isn’t it? Just send this message to his Other folder—What is this? I didn’t even know that there was an “Other” folder, and I suspect that most other people who use Facebook don’t know that either. And how do you pay that R2.51? By one of those methods that attracts a R100.00 minimum bank charge, perhaps? But I looked in my message folder and yes, there was an “Other” folder with a dimly marked tab hiding in the corner. I looked in it, and I discovered a whole bunch of messages from people that I hadn’t looked at, including some people I really wanted to hear from. There were three messages from me, which I had sent to myself nine months ago. You remember when Facebook changed every member’s e-mail address to a Facebook address about nine months ago? Actually you probably don’t, because Facebook never told anyone that they were doing it. Someone got wise to it, and put it on their timeline or status or wall or notes or whatever the thing is called now, and I saw that mine had been changed, and changed it back. But I didn’t know there was a Facebook address, so I decided to test it. I sent three messages to myself, which never arrived. Well I found them in my “Other” folder nine months later. I think Facebook is well on its way to becoming an antisocial network. The next crummy technical innovation is this new High Definition TV that there is all the hype about. The trouble is that I can’t see it half the time, because I have to close my eyes to listen to the dialogue. The sound is so badly synchronised with the picture that the characters’ lips move about a second before the sound comes out. They react to something oddly and only later do you hear the sound of the gunshot or whatever it was. So there’s this marvellously improved picture, but you can’t watch it because they cant synchronise the sound to it. One step forward, two steps back. What’s next? Bring on the Wurlitzers! So we have social networks turning into antisocial networks, whizz-kid programmers linking you to the wrong books, and silent movies with sound coming later. Isn’t science marvellous! Or is it just me, getting to be a grumpy and cantankerous old curmudgeon in my old age? After causing a raucous week by changing users’ listed email addresses to ones ending in @facebook.com, Facebook’s switch is causing yet another embarrassment for the company and problem for many users. The email switch has gone beyond the walls of Facebook, according to various users, who are saying that the change is affecting the emails listed in their contact books. Across the Web, people are saying the emails listed for many of their contacts in their address books have been replaced by @facebook.com emails. One of the things that got me using Facebook was that it enabled me to keep in touch or get in touch with old friends by finding their conact information, and they could get in touch with me by finding my e-mail address. But Facebook went and destroyed that functionality by replacing my real e-mail address with a bogus one, because the @facebook.com address that they replaced it with doesn’t even work. I’ve sent a few test e-mails to it, and none of them have shown up on Facebook. OK, I’ve changed my bogus e-mail address back to my real one, but most of my friends haven’t, because most of them probably don’t even know that Facebook has changed their addresses. So Facebook have destroyed their own most usefulm function. But it’s worse than that, they’ve changed the address books on lots of people’s mobile phones, if they were linked to Facebook, and as a result people are losing important e-mail’s because Facebook have hijacked their address books. Perhaps that should be the subject of a class action lawsuit, sueing Facebook for interfering with people’s mail. So maybe it’s time to bail out of Facebook. Well there are things like Linked-in, and Google+, and for the academically incline, academia.edu but perhaps it’s time for Google to dust off their little-known and well-hidden alternative to Facebook: Orkut. They don’t show it any more in the Google menus.They don’t publicise it at all, but it has thousands of users in Latin America and Asia, where it has been very popular. So how about joining Orkut now, and then leaving messages on Facebook asking all your Facebook friends to meet you there? I’ll be visiting Facebook a lot less frequently now, but I’ll still let my Twitter tweets be posted on Facebook — I just won’t see many comments that people make on Facebook. What is this thing called Klout? Several people invited me to look at a site called Klout, and so I did. I’ve been looking at it on and off for a month now, and trying to discover if it is of any use, and if so what it was useful for, and the answer, I believe, is “not much”. Some of the ideas behind it are quite intriguing, but I think it misses out in the implementation. The stated aim is to show who influences you, and who you influence in social networks, mainly Twitter, and which topics you are most influential in, and to give your “influence” a numerical score. I’m not sure how the score is calculated, but the calculation appears to be based on how many people retweet your tweets, and how many Twitter followers they have. I wrote about my initial impressions of it here and here, and my initial impressions have not changed much. I did link to a rather scary article, What Your Klout Score Really Means | Epicenter | Wired.com, which indicates that some people take the Klout score quite seriously, and that some people’s jobs depend on it. That’s about as idiotic as it gets. You might as well decide to hire or fire someone on the basis of their newspaper horoscope. One of the things that makes me think that it’s nothing more than a fun (for a little while) online toy is that its list of topics is altogether screwed up. And so is its way of calculating influence in the topics that it does list. Can anyone add to it? If you have looked at Klout and noticed some missing topics, perhaps you could list them in a comment. To give just one example, one of the people I follow on Twitter is Zwelinzima Vavi, the General Secretary of Cosatu (Congress of South African Trade Unions). So if there is one thing he influences people in, it is trade unions. But can you say that on Klout? Not a chance. As I said, I’d love to know what algorithm Klout uses to calculate these things. OK, I did tweet on a “health” topic today (about organ donation), but that was after I had seen my changed topic list. Some of the blogs I read (and bloggers I follow on Twitter) are members of the Anglican Church, and have influenced me on that topic. But can I say so on Klout? No. So which one do I use for the Anglican Bishop of Buckingham, Alan Wilson? His blog is in my blogroll and I follow him on Twitter, but his main sphere of influence is missing from Klout. What Klout has is sub-sub-topics, but no main topic for people like him. Out of curiosity I Googled for Wollondilly Anglican College, and found, somewhat to my surprise, that it actually exists. But it is not what I would call a “university”. And it’s not really a topic on which the Anglican Bishop of Buckingham has influenced me. But when I looked up Alan Wilson, Klout also noted that both Alan Wilson and I used Twitter as the primary way to spread our influence. That’s funny, because two days ago it said that 93% of my influence was spread through Facebook. I think it is sulking because it keeps asking me to invite my Facebook friends to Klout, and for the most part I haven’t done so. And one reason for not doing so is that the topics in which they have influenced me are missing from Klout. A little earlier, I compared Klout to a newspaper horoscope. A more apt comparison might be a toy that we used to play with in Grade 2. I haven’t seen one for years, but it was made out of folded paper, and someone would come up to you and ask you for a number between 1 and 10, and they woudl move the paper that number of times and an open it to reveal four coloured flaps, and ask you to choose a colour. Then they would lift one of the coloured flaps revealed and read out your fortune, which they had written there beforehand. I think Klout works a bit like those. I might stick around on Klout a bit to see if it improves, but I somehow doubt that it will. I think Facebook began to go downhill when it introduced “apps” – third-party services of dubious usefulness that tended to be fragmented very often duplicated each other. And it looks as though this is going to get worse. Facebook apps need only ask permission once to share stories on your behalf. Although not as big a deal as the Timeline, this tweak may be one of the more controversial. Previously, apps had to ask every time they shared information about you in your profile. Now, the first time you authorize the app, it will tell you what it’s going to share about you. If you’re cool with that, the app never has to ask you again. And that is why, if anyone invites me to something on Facebook, and it asks for access to information about my friends, I back out as quickly as possible. The last one that caught me like that was a thing called “Branch Out”, which at first sight looked a bit like Linked-In. If you joined, it asked which of your friends you would like to work with in various things. I went through it, thinking it might provide some useful, or at least interesting information at the end of this. It didn’t. Instead, it spammed my friends with a thing on their Facebook “wall” saying that I had said something about them in “Branch Out”. But if they went to “Branch Out” they would never find out what I was alleged to have said about them — they would just be asked to answer a similar series of questions, the sole purpose of which was to collect information so that their friends could be spammed in turn. In other words, the whole “Branch out” thing is a scam to collect information to spam people. And so it is with a lot of Facebook apps. Steve Hayes is using BranchOut on Facebook | Facebook. Actually I was trying to see if there is any way of opting out or resigning from “Branch out”. There doesn’t seem to be. I’m always presented with several “apps” relating to family history and genealogy, which are interests of mine. Two of the most insidious are MyHeritage and Geni.com. I actually encountered both outside of Facebook, but they too are traps for the unwary. You can see my criticisms of MyHeritage here, and Geni.com here. I like Facebook for keeping in touch with people I know — friends and family, especially those who are far away or whom I havent seen for a long time. It’s useful for making contact with long-lost friends and acquaintances or recently-discovered members of one’s extended family. It’s good for seeing what people are up to. But that’s about it. The other day my daughter invited me to Google+. 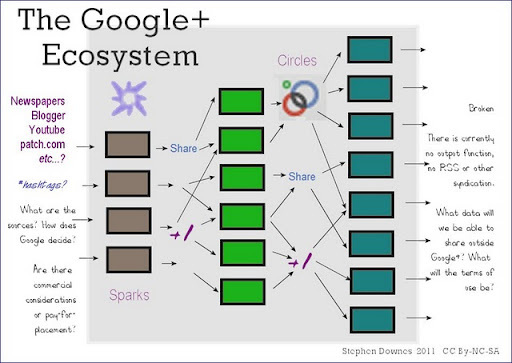 This is an illustration of the Google Plus Ecosystem I created to try to explain the flow of information through Google Plus from its (currently undocumented) sources through to its (currently broken) output. One of the problems I have found with this “me too” approach to designing social networking sites is that it is counterproductive. Initially there were improvements. First there was Geocities, which tried to group web sites according to themes and common interests, and promote interaction among the webmasters. Then it was taken over by Yahoo!, which didn’t understand the principle, and killed it. Then there was SixDegrees, which was real social networking, but before its time. The graphics loaded too slowly on the dial-up connections that most people used back then. Then there was MySpace, whose main drawback was that it was designed for (and possibly by) celeb-following 11-year-olds with its garish graphics. Then came Facebook, which was originally for undergraduates, and appealed to many with its clean, minimalist approach. When it was opened to the hoi polloi it became a useful place to keep in touch with friends, family, acquaintances, work colleagues and the like, though it also had the problem of people collecting “friends” like some people collect postage stamps, but indisciminately. It also became less useful when it branched out into third-party “apps”, which often competed with each other, and dispersed the effort. For example, you could have an app that linked to your favourite books and what you were reading. The problem was that there are about six other apps that do the same thing, and when you are using App A and your friend is using App B, then to compare books you have to enter all your books all over again in App B, very often with a clunky user interface. So I have a general rule of “No more apps”. If anyone invites me to anything on Facebook, and it has a rigmariole about asking my permission to access information about my friends, I click “Cancel” and go no further. And if I want a site to compare books and what I’m reading with my friends, I use one that does it well, like Good Reads. From there I copy my reviews of the more interesting books to one or other of my blogs, and from there an announcement filters through to Tumblr or Twitter to Facebook, so my Facebook friends can see what I’ve been reading, without using clumsy “apps”. But with Google+ the problem is likely to be exacerbated. Soon one will have one set of friends on one social networking site, and another set on another social networking site, and one will need a metasocialnetworking site to bring them all together in one place. Yahoo! recently dropped yet another of its useful services (MyBlogLog), and urged people to join Pulse instead, which is their attempt, like Google+, to compete with Facebook. Instead of doing what they do well, they prefer to do what other people do, badly. Yet another Yahoo! service bites the dust. I received the following e-mail from Yahoo! We will officially discontinue Yahoo! MyBlogLog effective May 24, 2011. Your agreement with Yahoo!, to the extent that it applies to the Yahoo! MyBlogLog, will terminate on May 24, 2011. The other social blogrolling service, BlogCatalog, became quite unusable about 5-6 months ago, so that’s the end of that. I wonder if it’s a sign that blogging itself is in decline? Yahoo! has a long history of taking over useful online services and then abandoning them. First it was Webring, then Geocities, and now MyBlogLog. That means that the last useful service they maintain is their listserver, Yahoogroups. It’s also something they took over from someone else, an outfit called e-Groups. If they abandon that, there’ll be nothing left that will make it worth remaining a member of Yahoo! My very own Internet stalkers? I seem to have got my very own Internet stalkers, or perhaps I share them with a zillion other people. I keep getting messages from this “Colin Bruce Milne” saying he wants to be my “friend” on this, that or the other social network. He sends me private messages to say that he has private messages for me. But I don’t know him, I’ve never actually talked to him or met him, he’s never left a comment on my blogs, which is quite easy to do. So why does he want to be my friend if he never talks to me, except for sending me private messages to say that he has a “private message” for me? It’s a bit like getting a slip from the post office asking you to call for a registered letter which tells you that you have a registered letter that tells you that you have a registered letter that tells you that you have a registered letter. So I now find myself wondering if perhaps this “Colin Bruce Milne” is some kind of new internet species, the “professional friend”. Perhaps he’s not a real person, perhaps he’s a ‘bot. But if he is a real person, I now suspect that he gets paid a commission by conning people into joining social networks by inviting them to join the network in order to read a message to tell them that he has left them a message on another social network that they will have to join to read the message that says that he has left them a message on another social network, and if he gets enough people to join enough networks he’ll qualify for the grand draw for the grand prize of a weekend in a timeshare resort in Naboomspruit, listening to salesman wittering on boringly about the benefits of timeshare. So perhaps he’s not my very own internet stalker, perhaps he’s stalking other people as well, having discovered a new way to propagate spam. What I really need is to find a way of introducing Colin Bruce Milne to Mr. John Erere. I’m sure they’ll get on like a house on fire. I could become a professional Internet friendship broker, introducing professional friends to each other, and possibly to my old friend, Mrs Mariam Abacha, from whom I haven’t heard for a long time. Perhaps I should forward the messages from Oxfam5 to Oxfam14 and vice versa, mutatis mutandis.